There are a few ways to thrill an aviation nerd at Christmas, like a flight to Peru, a stay at the newest W, and airline gear. Luckily the latter option is in a reasonable price range. Airlines and manufactures run online stores that sell a wide array of logo gear, models, and other interesting trinkets. I’ve ordered from Boeing, Airbus, United, and US Airways. 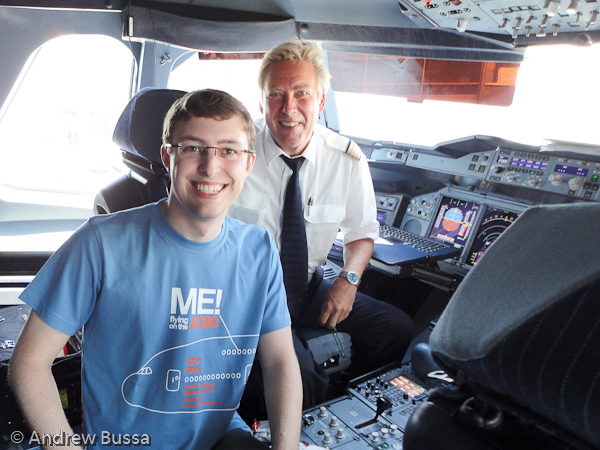 My favorite item is the custom A380 t-shirt from Airbus. I ordered a shirt for my first A380 flight, a first class trip on Lufthansa. It was a great trip and I’ll go into more detail in a future blog post. I wore the shirt on the flight and the flight crew loved it. They took pictures with me and I also got to visit the cockpit and meet the captain. It was a great item and got my trip off to a great start. Other passengers and lounge attendants also got a kick out of it. The downside of Airbus’ store is that they ship from Germany and have a rather high minimum order amount. The Boeing store operates through Amazon.com and has a wide selection of models and t-shirts. I picked up a Boeing tee and some of the cartoon airplane stickers. There is also a retail location in Chicago at the Boeing headquarters; it’s right by the Merta station and worth a look if you are in the area. Almost every airline has an online store and most of the products are focused on employees, but they do allow anyone to place an order. US Airways has a good store with lots of models, posters, and retro tees from brands they have absorbed. Sign up for their email list, they run good promotions on occasion. United’s store it outsourced and seems to be closing because everything is on clearance. They recently ran, without thinking it through all the way, a free shipping promotion with no minimum order. I picked up some luggage tags, a Ted teddy bear, and a Ted sleep kit all for under $10. An airline related gift could be that special and unique thing the you or the airline nerd you know would love of Christmas. There are quite a few, though not well advertised, options out there so give it a look. UPDATE: It appears the United shop has closed. None of their URLs work any more.